A brother asked the following question after having presented it to other brothers who were not able to provide a satisfying answer. No doubt it is difficult question and thus the answer will also be difficult and whenever an author passes away there is no way of knowing the basis behind his words or authorship neither is there any way of verifying or presenting questions about any unclear speech. So what follows inshaAllaah is by far the best possible explanations I can think of in defence of Allaaamah Muhammad Raees Nadwee, May Allaah have mercy on him. So the objection is ‘Miftaah al-Quloob’ is not Mulla Alee Qaaree’s book and if so, the full reference should be provided. This book is about tasawwuf and Mu’waa’iz ie admonition. Thus it is possible Allaamah Muhammad Raees may have referenced this book as Miftaah and Mugheeth are very similar especially when written in Arabic. It will not also be surprising to know those who have raised this objection will not even be aware of one third of the books authored by Mulla Alee Qaaree. Numerous books, in fact many of the books of Mulla Alee Qaaree have been printed over the last 2 centuries and one book has been given different titles, sometimes 2 different or even 3 different titles where as in essence the book is the same and therefore it is possible Allaamah Muhammad Raees may have referred to a book as ‘Miftaah al-Quloob’ which we may know as a different name. And there are many many example like this. It should also be noted the names of these books are not just on printed books but rather the names of these books differ with regards to their names on the manuscripts and when such is the case what chance to the normal readers have! So hence again it is possible Shaikh Muhammad Raees Nadwee may have referred to the ‘Miftaah al-Quloob’ which generically maybe known as a different book. Many books especially those propagating and promoting soofism, tasawwuf and alien concepts to Islaam and orthodox Sunnism have been continuously translated from Arabic into Urdu and this has been the case for well over 200 years. Example Mulla Alee Qaaree wrote a book on the biography and virtue of Shaikh Abdul Qaadir Jeelaanee titled, ‘Nuzhatul Khaatir al-Faatir Fee Tarjamah (in one manuscript ‘‘Manaaqib’) Sayyidee Abdul Qaadir’ (printed 1307H / 1890ce, Istanbul). Manuscripts of this book are available throughout the libraries around the world. Therefore again it is possible Shaikh Muhammad Raees may have referenced and referred to a translated book of Mulla Alee Qaaree which might have been titled ‘Miftaab al-Quloob’. I personally do not have the Arabic book and neither do I think it is easily available, if someone does come across please kindly inform us. Allaamah Muhammad Raees Nadwee was based in Jaamia Salafiyyah and its very possible he may had access to both books mentioned above in answer number three, and utilised the quote from this book but mistaking referenced it as ‘Miftaah al-Quloob’. This is highly relevant as the quote that is being questioned is regarding the position of Shaikh Abdul Qaadir Jeelaanee as quoted via Mulla Alee Qaaree!!! This is not unlikely especially with regards to some of the titles that are formulated for Shaikh Abdul Qaadir al-Jeelaanee’s book with words like Quloob and Miftaah!!! Another plausible explanation is that, as we know in the sub continent it is a common practise, publishing and printing houses reprint books with different titles or names. Sometimes instead of being reprints the publishing houses print these books as their publications and hence they might have given this book a different name which might have been referenced by our Shaikh Muhammad Raees!!! Shaikh Muhammad Raees Nadwee’s style of writing at times is very brief and if one consults his books it is clearly seen he often says, “Refer to the general books of hadeeth…” or “Refer to the general books of rijaal….” and this would often be done in order to keep discussion brief and to the point, this may have been one such point. If the Shaikh was alive then the ahnaaf…… we could have asked him!!! It is also possible that Shaikh Muhammad Raees Nadwee may have made a mistake in mentioning Mulla Alee Qaaree’s name for this quote, as he mentions him directly afterwards for the Sharh Fiqh ul-Akbar quote, which might have been a repetition and yet again it is very likely he might have mentioned Mulla Alee Qaarees for the first quote and made a common mistake of repetition of the author. This is very easily done and even major scholars have fallen short in this regard and there are numerous examples of this, in fact this is so common that only someone who is totally lost will deny this. Knowing the great Hadeeth Master on a personal level, he would sometimes get his students to write for him, so he would dictate from MEMORY and they would write for him. It is therefore possible this error might have crept in this way. 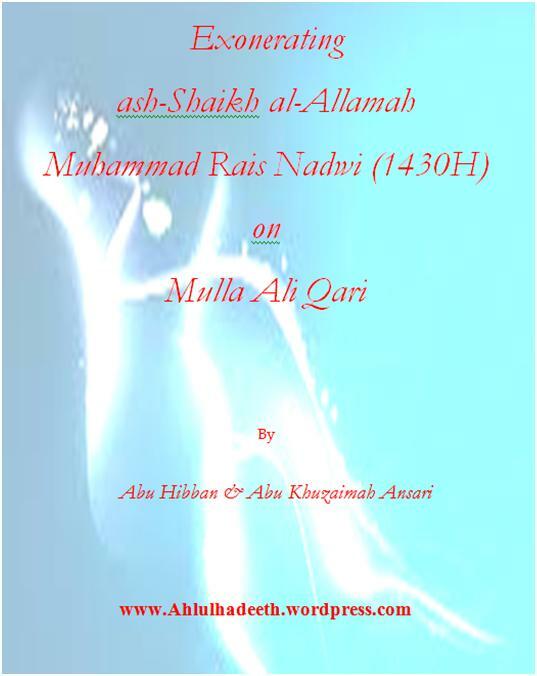 Allaamah Muhammad Raees Nadwees book was a newer edition with additional notes which was printed in 1419H / 1998ce (Jaamia Salafiyyah Edn) in answer to the newer addition of ‘ash-Shaahid’ authored by the Barailwee’s. It is highly unusual the Barailwees have decided to raise this objection now after over a decade when the pinnacles and the elite of the Soofiyyah Barailwiyyah of India did not raise any such objections at the time when the book was published in 1998. So the major Scholars of the Barailwiyyah Soofiyyah had no problem with this quote, so where has this objection come from now!!!! It is also very possible and likely that Shaikh Muhammad Raees Nadwee was unsure of the authenticity of this statement attributed to Mulla Alee Qaaree and then to Shaikh Abdul Qaadir Jeelaanee and hence the reason no reference was provided!!!! Are the objectors even attempting to deny this Aqeedah for Mulla Alee Qaaree, as we know and it is conclusively proven from him via his various well known and respected books that he refuted and denied the Aqeedah of the Omnipresence of the Messenger of Allaah (Sallalahu Alayhee Wasallam). For example refer to his Mirqaat Sharh Mishkaat and even his al-Mawdoo’aat al-Kabeer. In addition to this, eminent Deobandee Hanafee Scholars have affirmed this for him and so if this is a problem, the barailwees need to take this up with their fellow Deobandee brothers. There could have been a genuine mistake by Shaikh Muhammad Raees Nadwee with regards to this passage, whether the mistake is in citing the author, the name of the book or the quote itself. No one is free from errors and Shaikh Muhammad Raees Nadwee could have made a genuine mistake. So what, how can such a common point that occurs with almost every writer lead to the ultimatum that we must accept Allaamah Muhammad Raees Nadwee as an abandoned liar. This is indeed clutching at straws and wild adventurous thinking by some people at the very least in a failed bid and ploy to discredit the great Salafee Scholar.